I nodded my head. “I’m not too far behind you, buddy,” I said. I had a hell of a time at this last NFR because of injuries. It got so bad that in the final rounds I kept getting bucked off and Chase Dougherty kept winning. By Round Ten, he had won so much, he was about to pass me and win the World Championship. I went into the NFR worried about my riding elbow. It had been hurting all year, ever since Round Eight of the 2017 NFR, when I got on a bull from the eliminator pen. He had a big hop and skip. He pulled me down over his head with my hand still in the rope, and then he flipped my body up with his head. That jerked my elbow and hyperextended it. Throughout the 2018 season, it just never healed. I put up with the pain, but my elbow worked against me all year. I finally had it checked out after the end of the regular season. The MRI showed I had torn my ulnar collateral ligament, or UCL. The joint was separated. You could fold my arm around and slap me in the same shoulder. It was an eerie feeling. One of the Justin Sports Medicine doctors said my elbow was severely unstable, a ticking time bomb. I got that diagnosis in the middle of October, and for two weeks I was completely down in the dumps. I didn’t want to miss the NFR. I’d just set a new record for regular-season winnings and was hoping to win my fifth gold buckle in a row. But if my elbow exploded, it would go from a career-altering injury to a life-altering injury. If I did make it through the NFR, I could get Tommy John surgery, but you hear about some pitchers who get the surgery and never come back from it. For two weeks, I was questioning everything about my life, my career, my faith. Why did this happen to me? Finally, a little voice in my head was like, This is the situation you’re in. You can either give up, or you can do your best with what you’ve got. That day I decided I wasn’t gonna play the victim. I had to stop feeling sorry for myself and get ready for the NFR. I started working out, really trying to get stronger. I went to a doctor in Austin to have my elbow injected with a steroid to calm the inflammation. He’d seen the MRIs. He knew about the tear and the joint separation. As he evaluated my elbow, bending it through twenty-seven different positions, he got this perplexed look on his face. I started getting worried. I was like, Okay, this is weird. I don’t like it when doctors aren’t one-hundred-percent sure about what they’re looking at. He put me under a live X-ray and was observing the joint. At one point, he kind of wrenched on my elbow. Then he looked right at me. He said scar tissue will form over a ligament tear. Usually that tissue breaks apart and the joint becomes unstable, but that wasn’t the case here. I still felt pain because bone fragments in my elbow were hitting a nerve, but otherwise I was good to go. He gave me a shot of a mild steroid and sent me home to continue preparing. I’m a faith-oriented, God-loving man—I don’t like to say God-fearing—and I just knew that this was a God thing. This is what I was put on this Earth to do, I thought. This is my year at the finals. God wants me there. I knew that wholeheartedly. There was no other explanation. It gave me peace of mind, but I still went into the NFR thinking about my elbow. By the end of Round Ten, my elbow was the only part of me that didn’t hurt. For Round One I had the best draw I’ve ever had in the first round at the NFR—Mortimer from Big Stone Rodeo. He fits my style really well, which was great since I hadn’t been on a bull for two months while letting my elbow heal. I was rusty, and Mortimer was that safety net I needed. It was a smooth, clean ride, but whenever I went to pull my tail, my hand came out of my rope. It was kind of like pulling the ripcord—a real Jesus-take-the-wheel moment—because at that point, I was sitting on a hard-bucking bull with no control whatsoever. As a bull rider, my get-offs are one of my strongest attributes. You hardly ever see me get off in a bad spot. Honestly, probably half the time I land on my feet. It’s one of the main reasons I’ve stayed healthy through the years, because I can get off clean. You see guys getting really bumped and bruised and hurt, and it’s all from hitting the ground and getting stepped on, even after they make the whistle. That’s when ninety-nine percent of bull-riding injuries happen. I was always kind of catty growing up. From an early age, I worked hard at being good at getting off a bull. I’ve always looked at getting off as a two-jump process. As you pull your tail, you can slide out when he rears up. Then, when the bull kicks, you catch the momentum of his hip. He’ll throw you a good five or ten feet. All you have to do is relax and slide to whatever side of the bull you want to get off on. It’s kind of like a gymnast when he hits a vault and flips, only we’re using the bull’s force and contorting our body out of the way. But when you pull your tail, your hand has to stay in your handle so you can make a controlled get-off. That night, when I pulled my tail and my hand came all the way out, I leaned back but no longer had a fulcrum. I had nothing to hold on to. I was just sliding around on the back of the bull. He reared and kicked and slammed me on my shoulder. My riding shoulder. I hit the ground and immediately knew my shoulder separated. You just feel it. I’ve got bad shoulders. It happens to me about once a year. It’s not like the joint pops out of the socket, but where the collarbone connects to the shoulder, the ligaments get stretched. I walked into the sports medicine room, got some ice and taped it up. That’s about all you can do for it—tape it and rest it. The pain didn’t start until the adrenaline died down, around the time I laid down that night. The next morning, my shoulder was super painful. I was signing autographs and shaking hands and giving hugs, and it hurt like heck. You never experienced pain until you have a separated shoulder and everybody wants a picture. You put your arm around them, and they jerk away, and it’s like, Gosh, dang! That was the beginning of the snowball of injuries that made the rest of the NFR so challenging. For Round Four, I was super excited about the bull I drew. He was this little black bull from Universal Pro Rodeo. I watched some videos, and he seemed right up my alley. But he was bad in the box. With the shoulder of my free arm hurt and my riding hand tied in, it was hard to protect myself. We fought him for a while. I nodded, and he reared up and moved to the front of the chute. When he did, the chute slides shoved my legs back and pushed me a foot off my rope, and then he started out the gate backwards. My mind was going a million miles a second. I knew I could get a reride if I declared myself. Three options ran through my head, and none of them were any good: 1) try to ride through it and see what happens, 2) double grab and declare myself, or 3) hang on to the back of the chute and try to get my hand out and act like nothing ever happened. I went with option three. Don’t ask me why, since it was probably the worst. I was trying to stay in the chute, reaching across my body to the right, with the bull headed out to the left. My hand hung a little in my rope, and I got jerked away from everything. Well, that twisting force really, really jacked up my back and ribs and even my sternum. To this day, I’m still not sure what all happened to it. But it sent the whole right side of my body into these muscle spasms. This was a new pain, a new feeling for me. I instantly knew something wasn’t right. The next thing I know, somebody’s yelling at me, Hey, do you want your reride? When you’re at the National Finals Rodeo, it’s hard to say no, right? If you get off and you have a zero, you take the reride. So I did, but I noticed I didn’t have a whole lot of power in the right side of my body, including my riding arm. As soon as the bull apexed from the rear to the kick, instead of me lifting up on the rope and staying close, I felt the bull drop three feet away from me, leaving me way off my rope. I bucked off. Something was seriously wrong with my body. I ended up back in the Justin Sports Medicine room, this time trying to figure out what the heck happened to the muscles on my right side. When I would flex my muscles, it felt like they were working as hard as possible, but when the medical tech touched them, he said they felt soft, almost mushy. For some reason, my muscles, including my pecs, weren’t firing. It was the same with the whole right side of my back. I had no strength. I literally couldn’t open a car door. To make matters worse, since Round One, when I injured my left shoulder, my whole left side was trying to compensate for the shoulder. Now that I hurt my right ribs and arm, my whole right side was doing the same, trying to compensate. Both sides were fighting against each other to find a comfortable spot for the injuries to rest without pain. The next couple of nights, it was the same thing. I had no power in my riding arm. I couldn’t keep myself close to my rope, and I bucked off. The forward movement of the bulls was giving me the most trouble. Any time they moved forward, they took ground that I needed, and I was too weak to do anything about it. I kept drawing easy bulls, but ones whose bucking style had a lot of forward movement. Every time I got my stock draw, I’d think, Well, here we go again. My pride started hurting. Bulls that would normally have had maybe a one-in-a-hundred chance of throwing me off were just manhandling me. It got to the point where even going to the rodeo was miserable. Night after night after night, it felt like my body wouldn’t let me perform. I had no control at all from the time I nodded my head to the time I hit the ground. It was a pretty helpless feeling, to be honest, like willingly strapping yourself into a car wreck and hoping everything goes well. Looking back, it was kind of ridiculous that I kept trying to compete. Out of nine go-rounds, I bucked off in six. I hit the ground harder at the NFR than I do in an average three- or four-month span during the regular season. My body was hurting, and my pride was hurting. Even worse, my number one spot was at risk because of all the ground money Chase Dougherty was winning. I’m a pretty emotional guy, even though I don’t wear it on my sleeve a whole lot. I keep my feelings private. One reason I never threw my sucker in the dirt was thinking about my dear friend JR Vezain, who’s in a wheelchair learning to walk again. He was my inspiration through it all. It didn’t matter what I was going through. I knew JR was going through something a lot harder. He would have loved to have been out there competing on that dirt in the Thomas & Mack. He’s got the attitude of a freaking champion. He was sitting there saying, You know, the world is great, God is good, and nothing’s going to change that. I was like, Man, my fights aren’t that big. I haven’t even told JR any of this, but I hope he reads it and knows that he’s a big reason I kept a level head despite everything I was going through. By Round Nine, I was like, You know, Sage, you better stay on one of these bulls, because if you don’t, Chase is going to keep winning. In Round Nine, I drew another bull with a lot of forward movement and didn’t make the whistle. In Round Ten, I drew a bull called Shootin’ Stars from Beutler & Son Rodeo. I knew he had a tendency to move forward on the first jump but pretty much stay in place and spin the rest of the time. He bucks extremely hard, but he wasn’t one of these grit-your-teeth-and-hold-on-tight type bulls. I might be able to make the whistle by relying on balance and counter moves. I crunched the numbers. It was tight. If Chase won the go-round and was only one of two guys to make the whistle, he’d win the World. If I stayed on, no matter whether my score was fifty or ninety, the gold buckle was mine. That’s all I thought about—me staying on—because that was the only thing I could control. Then I got to thinking: This was the TV pen, not the eliminator pen. Surely at least three guys would make the whistle. Sitting there in the back of the chutes, I started to relax a little. I was feeling pretty chill. There were a few matchups that I thought would be dead easy. Those guys will stay on, no problem, I thought. Well, those guys got thrown off their bulls. I tried to keep in a good frame of mind. Stay on your bull, I kept telling myself. Just stay on your bull. That’s all you gotta do. At the NFR, you have to get ready early for the production to keep moving along smoothly. Eli Vastbinder, the hype man, was there firing me up. It sent chills up my spine. 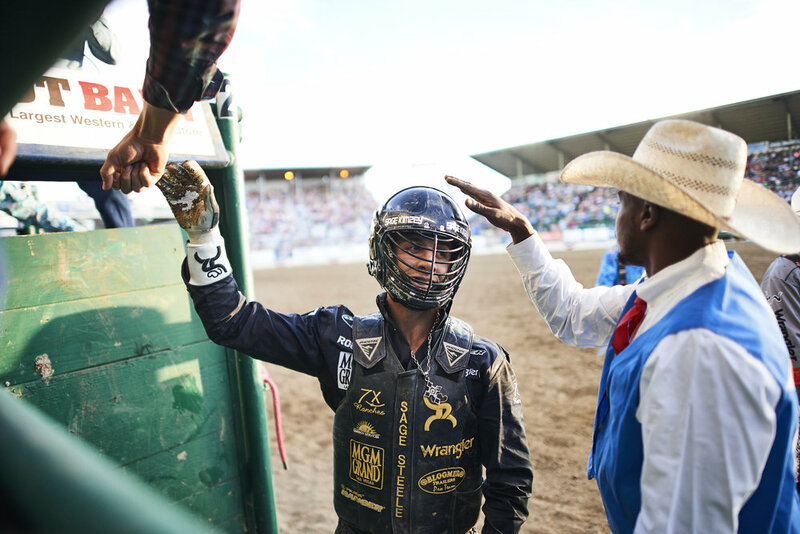 I thought, Damn, this is going to be historic, because I’m either going to stay on and be only the second man ever to win five championships in a row in the bull riding, or this is going to be the first year I lose the world title since I turned professional. That thought was laying on me heavy. I was like, Okay, turn your brain off. Just ride. Turn your brain off. Just ride. That’s all that matters. I got on my bull. Eli was pumping me up the whole time. I was ready to rip this thing’s head off! On a scale of one to ten, I was a thirteen by that point. Right then, Chase finished his ride. Looking out through the slats, I couldn’t see his score. But I heard the crowd. The only other ride on the board was 83, and I was like, Man, if the crowd’s going this crazy, it definitely beat an 83. Son of a gun, I thought, this ride’s for a gold buckle. There was no doubt about it. It was either stay on and win the World Championship or buck off and settle for second. I swear, as soon as he said it, a feeling of certainty came over my body. I was like, He’s right. This is exactly the moment I’ve dreamed about ever since I was three years old. Man, my heart was racing. It’s surprising I didn’t have a heart attack that night. My motor was freaking running. I got the bull standing absolutely perfect. I nodded my head. The bull came out, and he went to spinning, and I got in time with him, and I was, like, Yes, perfect! This is all I needed. Just get in time with him, and it’s game over. Four seconds in, he stumbled. Well, that threw my timing out the window. I went from the perfect position to fighting to get back in position, but I didn’t have any strength in my riding arm to get me there. I used timing and counter moves to quickly get back into a decent position. As a bull rider, I have a pretty good internal clock. I know when it’s been eight seconds. Right at about seven seconds, the bull stumbled again and again threw off my timing. All I needed was a half jump, so I threw caution to the wind and raised my left knee on top of his hump and thought, Just don’t let go! Whatever it takes, just don’t let go. I knew I’d get slammed in the worst place possible. Sure enough, he bucked me off right under him. By the grace of God and great bullfighters, he didn’t step all over me, because he definitely had the chance to. I don’t know that I’ve ever had such an exhilarating release of emotions as when I looked up and saw everybody with their thumbs up signaling that I made a qualified ride. The crowd rose to its feet, and I saw that I was 93 points. I did it! I stayed on and managed to score one of my career highs. It was good enough to win the World Championship. It’s crazy to think that I’ve been a professional bull rider for five years now, and I’ve never come in second. This was by far my toughest NFR ever. I’ve had trials and tribulations before. I separated a shoulder during my rookie year NFR. I messed up my elbow. But those were little rainstorms instead of a hurricane. I never take the gold buckle for granted, but this year’s World Championship title means more to me than ever before. I’m a firm believer that everything happens for a reason. It started with my elbow during the regular season and ended with all the other stuff at the NFR. You don’t appreciate the pain and anguish while it’s happening, but I’m sure there was a reason for it. I know I grew as a person because of it. That’s what it’s all about in the end of it, you know, being a better person tomorrow than who I am today.